Lyle: It's important to know how to jam in different styles. I will be showing you how to jam the blues, rock, metal, jazz, classical, Latin, swing, and tonight's lesson country. Lyle: Most country jams use major chords. Lyle: 8 bars/measures total. Starts and ends on E.
Lyle: The basic country style rhythm uses the "alternating bass" rhythm. Lyle: Notice you pluck a bass note, then strum, then a different bass note, then strum, to complete one measure. Lyle: How we doing? Can you play the rhythm riff right along with me? Click the loop button under the TAB so you can play right along with me. Lyle: Now you're going to learn a basic country style riff that you'll use for each chord. Lyle: The three chords in the progression are all major related. So you want to think major pentatonic scales for each chord. Lyle: For this riff, use your pick on the 3rd string, then "claw" the 2nd and 1st strings with your index and middle fingers. Watch video clip. Lyle: Now try putting that riff with each chord in the progression. Lyle: Yes, try to think ahead. 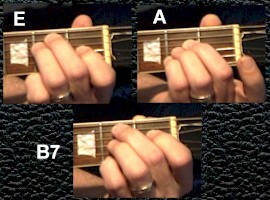 Lyle: For more help with playing this style, check out Country Guitar For Beginners in the Riff Interactive catalog. Lyle: Next lesson we'll cover something bluesy. Lyle: By the end of this series you should be able to play a little something in several styles. Lyle: That's all for this lesson, let me hear a yeee haw! Lyle: I gotta go now so have a good night!